The first wave of human evolution was based on the availability of water; civilizations flourished where we found rivers. The second wave of development occurred with the help of roads; people migrated to those places which had roads so that industrialization can happen. And now, the third wave of human evolution will be based on information and connectivity; people will chose to be in those places where one can get seamless Internet and aid of Technology. PM Modi and the current Indian Government is fully aware of this fact, and this is the reason the vision of Digital India was formulated with an allocated budget of Rs 1 Lakh Crore. 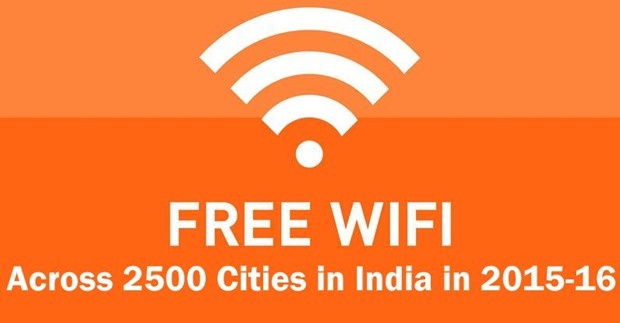 Under this vision, India has just received the biggest push till date, as Indian Government has announced that free WiFi would be rolled out in 2500 cities across India, and a special fund of Rs 7000 crore has been created for this mega project. State-run telecom firm BSNL would implement this huge infrastructure of Wifi connectivity. BSNL chairman and managing director Anupam Shrivastava said, “The services will begin in the next financial year (2015-16) and we plan to offer these to subscribers of all mobile operators,”. As per the initial plan, this Wifi service would work just like a normal data plan, which telecom companies provide. BSNL and MTNL subscribers will simply shift to ‘roaming mode’ when outside their service coverage area, and subscribers of other mobile networks will be accommodated under special plans from BSNL or MTNL. Initially, the service would be rolled out in Kolkata, Chennai, Lucknow, Dehradun, Hyderabad, Varanasi, Bhopal, Jaipur, Patna, Indore, Chandigarh and Ludhiana, and overall, around ’50,000 – 60,000 Wifi Hotspots’ would be created all over the country. The best thing is that WiFi under this scheme would be at ‘4G Level’, aided with broadband optical fibre and state of the art technological infrastructure. There would be paid service option for using Wifi, once the designated free limit is crossed, something similar to Wifi services in airports. Detailed information for the same is awaited. Is this a BSNL Survival Plan? Besides giving a tremendous boost to the digital economy such as ecommerce, digital publishing and online games, this project will also benefit BSNL, which has incurred losses of Rs 7000 crore in the last fiscal year. Interestingly, almost half of BSNL’s current fixed line business revenues come from mobile and broadband Internet services. With such a nation wide WiFi service, BSNL will certainly experience a major jump in their profits. In order to ensure high quality service, we think that Government should allocate this project under open tender system, thereby inviting private organizations with their expertise and specialization in this niche. Earlier, Department of Telecom had announced WiFi in 705 locations, across 45 cities. It is not yet clear whether this new announcement is part of the earlier project or not. "Digital India's Biggest Push: Free WiFi Across 2500 Cities; Rs 7000 Cr Budget Allocated", 5 out of 5 based on 1 ratings. Sadly, this free word comes with a time limit.. Yes, presently, almost all major AirPort in the country has Wifi, but most, if not all of them comes with a time limitation of maximum 30 mins of free Wifi. After which the user would be diverted towards their plans, which may goes as high as Rs. 120/- for a 24 hours access. I have been traveling and frankly, in many airports, even in New Delhi, not all terminals has best coverage. There is a lot of black or dead spot or signals are way too weak for a stable workable connection. Often I end up switching to my 3G connection to satisfy the need. It’s a huge project which, in case it get fully developed, deserves admiration. The nation will be connected not only to the businesses within but also with the world.